Boo's Haunted Bash is a haunted house/forest board hosted by Boo in Mario Party 4. He built it because he loves scaring people, and wanted his friends to be scared here as much as possible. Here, Boos are everywhere, and are put in charge of the games and shops (the one hosting wears a wizard's hat and cape). The main attractions here are the Mystery Train, and the Red Boo bridges. Every time a player passes the Big Red Boo, he and the bridges would disappear, and reappear when another player came by. The Boo that is in charge of the Mystery Train (a set of four transparent coffins) will not give rides as long as the bridges are there. While they're gone, players can ride on the train. 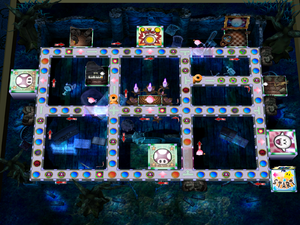 While on it, players are able to change direction of the train to other parts of the board until they reach the graveyard (a side on the board). Other players that get in the way get on board too, so that they also end up where the player in front is heading. There are only two Happening Spaces on the entire board-at the top-right corner. Players that land on one make a clock count down to when the infamous Big Boo comes. When the ? Space activates three times, Big Boo appears. He steals coins (for fifteen coins) or stars (for 150) from the other players, and gives them to the player who summons him. The Gaddlight for scaring away a Boo from the Boo's Crystal Ball who is after the player's coins and stars does not work for the Big Boo. Because he steals coins or stars from all three of the other players and it is as if all three opponent players are one player. The Item Minigame of the board involved a big trumpet. Three items go in the trumpet. After they scramble, players have to jump on one of the buttons. This makes the trumpet play a note, and release one of the items it has. That item goes to the player. The Coin Minigame, Rhythm and Boo, involves a piano. Players have to keep up with the Boo to press the buttons shown on the keys. The more keys they get right at the end of the game, the more coins are given (mistakes or not reacting meant less coins). In Story Mode, if the player beats their opponents on the board, Boo challenges them to a Minigame called Mystic Match 'Em in order to win his present. This page was last edited on January 30, 2019, at 20:44.